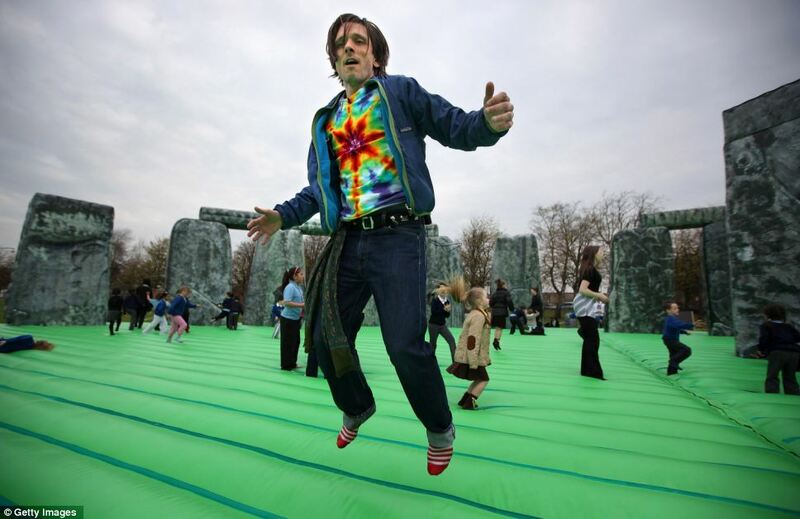 Children were walking on air today after Turner Prize-winning artist Jeremy Deller unveiled his life-size bouncy castle… of Stonehenge. 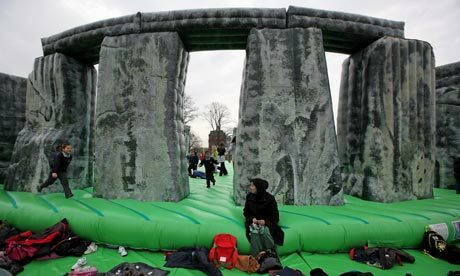 The 20ft-high inflatable, called Sacrilege, is modelled on the prehistoric monoliths and was opened to the public on Glasgow Green as part of the 18-day Glasgow International Festival of Visual Arts Festival. 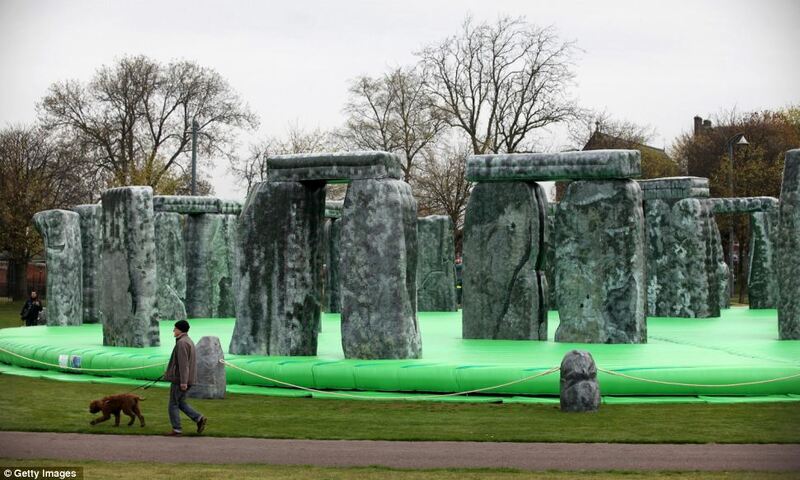 It was designed using detailed plans of the Salisbury monument and took two months to make thanks to the efforts of workers at Inflatable World Leisure, who Mr Deller said built the first ever bouncy castles in the UK. His giant inflatable is one of the highlights of a festival programme featuring more than 130 artists at almost 50 venues across the city. 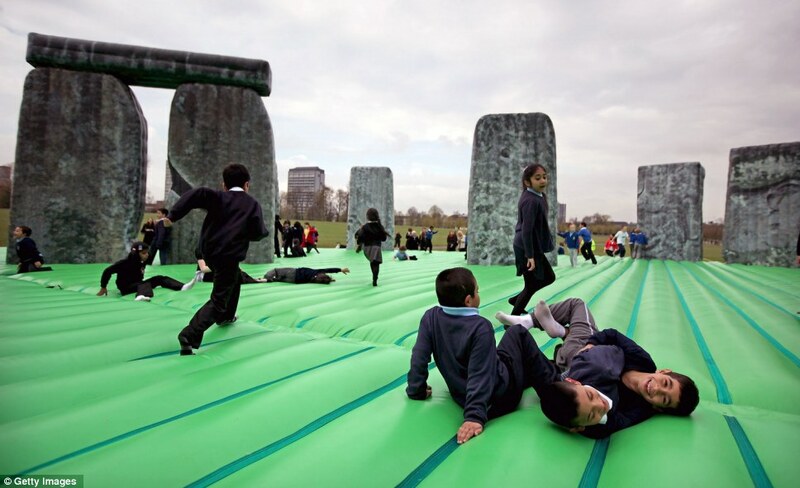 Mr Deller, who won the Turner Prize in 2004, said: ‘It has taken two months to put together so it is wonderful to finally see it up and being used by the public. ‘Stonehenge is a part of our history and it is such an iconic structure that I wanted to recreate it as accurately as I could. After appearing in Glasgow, the castle – the artist’s first major work in Scotland – will be taken on a tour of the UK. Other highlights at the Glasgow festival include solo shows by Glasgow-based 2009 Turner Prize winner Richard Wright, Adrian Wiszniewski and Karla Black. The festival also includes the first UK show called Triumph, an installation of more than 2,500 discarded sporting trophies collected by Polish-born Aleksandra Mir, and an exhibition focused on Glasgow’s Socialist Sunday School movement that flourished in the early 20th century. More than 90 per cent of the work on show during the 18-day festival is either new or previously unseen in the UK. There will also be a range of newly commissioned works drawing on other artistic disciplines such as dance, film and music. Teacher Lynda Darrock, 31, visited the bouncy castle with children from Annette Street Primary School in Govan, Glasgow. She said: ‘The children thought it was absolutely amazing. They were talking about it all day, I even had a go myself. ‘They keep asking if we are going back. ‘Jeremy spent lots of time talking to the children beforehand and afterwards asking if they enjoyed it. He was brilliant. The Wiltshire monument was completed around 4,500 years ago and is believed to have taken around 35 years to complete. The largest of the gigantic upright stones weighs about 40 tons – the equivalent of an articulated lorry. A Time Team dig (for the Channel 4 show) in 2009 established that Stonehenge was built around the same time as Durrington Walls, another henge, or circular earthwork, two miles away. The two adjacent henges were part of the same complex, with Durrington Walls the location for a massive Neolithic village that housed the workers who built Stonehenge. The Time Team suggested that this site housed up to 4,000 people, which would have made it the largest Neolithic settlement in north-west Europe. While the circle at Durrington Walls represented life and the land of the living, Stonehenge, encircled by burial mounds, represented the land of the dead, the team claimed. The two were connected by the River Avon and the procession route from one to the other represented the transition from life to death. It is thought that the stones used at Stonehenge were moved from Marlborough Downs, about 20 miles to the north. Digs suggest that the area around the stone circle was used to bury the cremated remains of hundreds of people. Other experts believe that it was a place for healing. Meanwhile, a study earlier this week suggested Stonehenge could have been designed with acoustics in mind like a Greek or Roman theatre. A team of researchers from the University of Salford spent four years studying the historic site’s acoustic properties in a bid to crack the mystery of why it was built. While they could not confirm the exact purpose of the stones, the researchers did find the space reacted to acoustic activity in a way that would have been noticeable to the Neolithic man. ‘Stonehenge is very well known, but people are still trying to find out what it was built for and we thought that doing this research would bring an element of archaeology that so far hasn’t been looked at,’ lead researcher, Bruno Fazenda said. He added the new area of acoustic science, named archaeoacoustics, could be helpful in the archaeological interpretation of important buildings and heritage sites, some of which may not exist in their original form, such as in the case of Stonehenge. Because the site in Wiltshire is in a derelict state, researchers travelled to Maryhill in the U.S. where a full-sized concrete reconstruction of Stonehenge was built in 1929 as a memorial to the soldiers of WWI. They were able to make proper acoustic measurements that allowed an investigation into striking acoustic effects such as echoes, resonances and whispering gallery effects. The second phase consisted in the creation of a full 3D audio-rendition of the space using a system comprised of 64 audio channels and loudspeakers especially developed at the University of Salford based on Wave Field Synthesis. This system enables an accurate and immersive recreation of what Stonehenge would have sounded like. 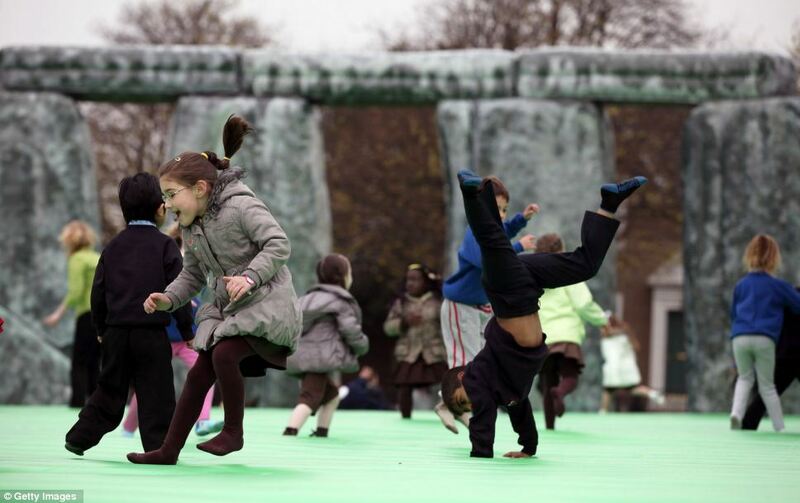 Salford‘s clever academics, who once took me shopping in a virtual supermarket – you sat in an armchair wearing a helmet and a glove – have now recreated the sound of Stonehenge. We are nowhere nearer cracking the mystery of the monument as a result; but who would want to be? Apart from all the mountains of remaindered books of theories, a puzzle solved is never as gripping as a conundrum still under way. But the four-year project by Dr Bruno Fazenda and colleagues atHuddersfield and Bristol universities, has established how the shouts, speeches, songs or sacrificial screams would have sounded, whatever material they may have contained. The method has been a painstaking piece of ‘archaeoacoustics’, a relatively new discipline which reveals the sound quality of buildings from the past. Stonehenge is very well known, but people are still trying to find out what it was built for and we thought that doing this research would add an element of archaeology that so far hasn’t been looked at. 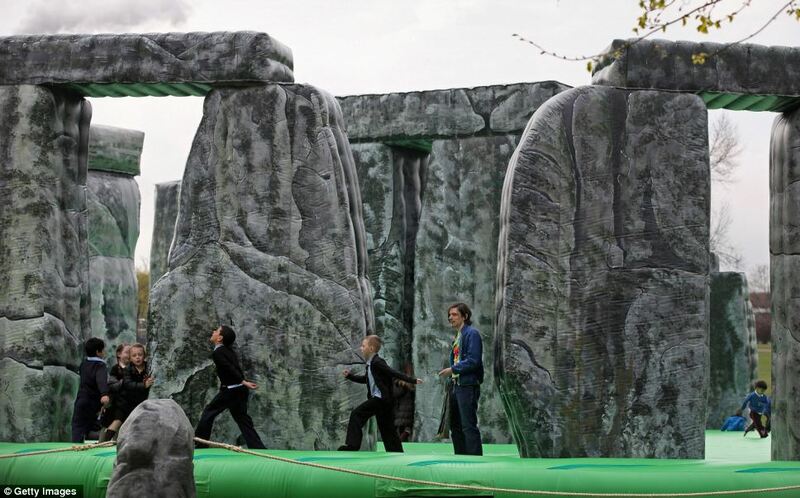 It’s a new area of acoustic science and it could be very helpful in the archaeological interpretation of important buildings and heritage sites, some of which may not exist in their original form, such as in the case of Stonehenge. The number of missing bits at the famous stone circle by the A303 in Wiltshire was an obvious problem, and tests there by the team produced only a limited number of weak echoes and no noticeable reverberation. Ancient Britons would not have been terribly overawed by this, if the monument was built to impress. But luckily there is a full-sized replica in the United States. It was possible to make proper acoustic measurements that allow an investigation into striking effects such as echoes, resonances and whispering gallery effects. The data gathered does not unequivocally reveal whether the site was designed with acoustics in mind, like Greek or Roman theatres. It nevertheless shows that the space reacted to acoustic activity in a way that would have been noticeable to the Neolithic man. This system give us an accurate and immersive recreation of what Stonehenge would have sounded like. We can not only see ourselves surrounded by the stones using virtual reality, but we can also listen how the stone structure would have enveloped people in a sonic experience. It is as if we can travel back in time and experience the space in a more holistic way. There’s more on the subject on a separate and excellent website called Sonic Wonders which has all manner of acoustic revelations. Here’s a clapping experiment on YouTube courtesy of them – background details are here. Einstein once declared that ‘the most beautiful thing we can experience is the mysterious’, and this statement is particularly fitting as regards Stonehenge. It was declared a World Heritage Site in 1986 and retains its intensely spiritual and otherworldly ambience, despite the number of tourists it attracts. If you choose to visit this extraordinary site, ensure you also spend some time delving into the captivating areas that surround Stonehenge. Explore picturesque Windsor and beguiling Bath. Modern archaeological techniques and a number of recent digs have helped to form new theories about the stones that constitute Stonehenge. However, their definitive use stays as enigmatic as ever; it is suffused with a continuing sense of mystery. Stonehenge stands as an authoritative witness to the once extraordinary civilisations of the Stone and Bronze Ages of around 3,700 BC to 1,600 BC. Similarly, its surrounding areas stand as testament to these mighty cultures. There is no place on earth quite like Stonehenge. Its brooding, pervasive mysticism, its intense spirituality and its endless aura of mystery all combine to make it an inimitable, idiosyncratic landmark. Take a Stonehenge tour and discover just why it continues to fascinate and perplex people from all over the world. You may not know that Stonehenge is not the only ancient site in this region. Yet, in fact, a mere 25 miles north of Stonehenge is the impressive Avebury complex, which is a robust contender to be the most grandiose of all the residual prehistoric earthworks in Europe. The Avebury stone circle is actually much greater than that of Stonehenge – but the stones are smaller. A strong benefit that comes of visiting Avebury is that you can in fact touch its stones. Woodhenge, which consists of a circle of wooden posts, is an even more obscure and oft overlooked landmark. 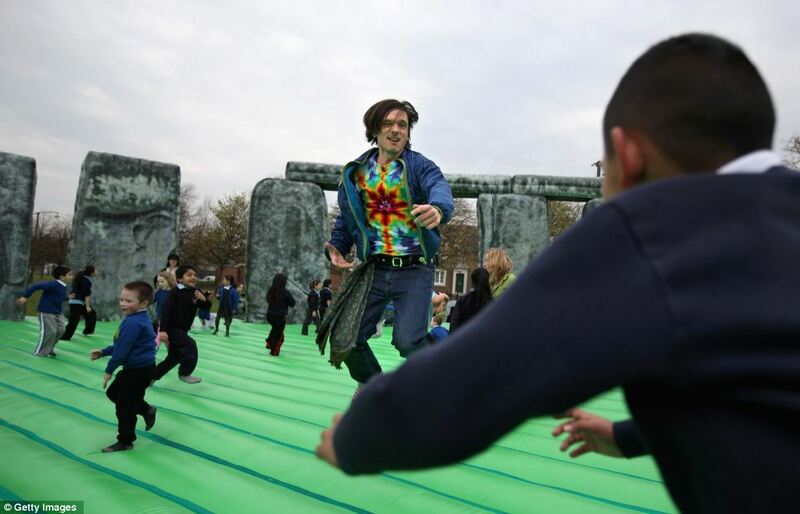 Theories as to the use of Stonehenge range from the eminently believable to the absurd. In the twentieth century, both Fred Hoyle and Gerald Hawkins fascinatingly argued that not only was Stonehenge used as an observatory, but also to calculate future astronomical events such as eclipses. Yet it is probably von Däniken’s theory about Stonehenge that has led to the most furore, conflict and general disputation. 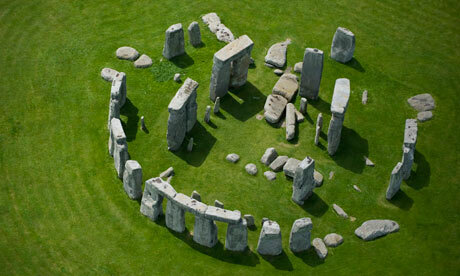 Däniken claims that either extraterrestrials, or humans who were aided by extraterrestrials, built Stonehenge. He then goes on to argue that Stonehenge is an exact replica of our solar system, including the asteroid belt. Why not merge a visit to Stonehenge with visits to its nearby districts, which hold their own captivating and idiosyncratic attractions? A combination Bath and Stonehenge tour from London is one of the most extraordinary tours you can do. Bath is, without a doubt, one of the most absorbing destinations to explore in the UK. An especially great number of visitors assemble to view the extraordinary sunrise at the summer solstice.